The NBA playoffs begin on April 13th. All eight Western teams have been decided and five Eastern teams have clinched a spot. The final three seeds in the East, and really, all the seeds in the West, are still way up in the air. What follows is everything you need to know about where things stand entering Thursday, March 28. Teams are listed in order of current seed, with the projected finishing seed, along with the SportsLine data used to determine that finishing seed, below. This post will continue to update for the remainder of the season as we keep track of these races right down to the wire. The Warriors moved back into the No. 1 seed with a win over Charlotte, and a Denver loss to the Wizards, Sunday night. Golden State plays Denver on Tuesday night. 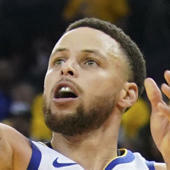 A win would go a long way to securing the 1-seed for the Warriors as it would give them a two-game lead in the loss column plus the season tiebreaker, which would make that lead three games effectively, with just five games to play at that point. Denver took a bad loss to the Wizards on Sunday night, but a win over Golden State on Tuesday would put the Nuggets right back in the No. 1 seed. Denver has a three-game lead over both Houston and Portland in the loss column, but it's not out of the question that one of those teams could still catch them given the Nuggets' tough closing schedule. Houston, in fact, owns the tiebreaker over Denver, so that's really only a two-game separation. Three of the Rockets' remaining five games are against the Kings, Knicks and Suns. Entering Monday they are tied in the loss column with Portland for the No. 3 seed, but currently have one more win. Portland owns the tiebreaker and thus controls its own destiny for the No. 3 seed. SportsLine likes Houston to prevail because of Portland's two remaining games against the Nuggets coupled with Jusuf Nurkic's season-ending injury. Repeated from above: Entering Monday the Blazers are tied in the loss column with Houston but technically trail in the standings because they have one fewer win than the Rockets. Portland, with six games left to Houston's five, owns the tiebreaker and thus controls its own destiny for the No. 3 seed. Our projections like the Jazz to stay ahead of a crowded field and ultimately secure the No. 5 seed, largely because of their soft remaining schedule and the fact that they own the tiebreaker over the Clippers and the Spurs, the two teams currently just behind Clippers. Getting into the top four is not likely for Utah. Three of the Clippers' remaining four games are against the Rockets (fighting for the No. 3 seed), the Warriors (fighting for the No. 1 seed) and the Jazz (fighting for the No. 5 seed). That's tough. Good thing the Clips have a two-game lead in the loss column over both No. 7 San Antonio and No. 8 OKC entering Monday -- though the Spurs do have a slight tiebreaker advantage, for now, via a better conference record. The Spurs are tied in the loss column with OKC but own the tiebreaker. San Antonio has the easiest remaining schedule of the eight Western playoff teams, with four of its final five games against the Hawks, Wizards, Cavaliers and Mavericks. Just like the No. 3 seed is pivotal for avoiding Golden State (again, assuming they stay at No. 1) in the second round, the No. 7 seed is perhaps even bigger because it would mean avoiding the champs in the first round. The Thunder took a horrific loss the Mavericks, who were playing without Luka Doncic, on Sunday. It dropped OKC back into the No. 8 spot -- tied with San Antonio in the loss column but the Spurs own the tiebreaker, where they would get Golden State in the first round should seeds hold. Remember when the Thunder were looking like a great bet to finish in the top four, if not the top three? Things change fast in the West. The fact that San Antonio owns the tiebreaker over OKC is a big hurdle for the Thunder to climb, and the main reason our projections have them sticking in the No. 8 spot. The Bucks have a three-game lead in the loss column over Toronto with four games to play, and they own the tiebreaker. The No. 1 seed, both in the East and overall, is all but locked up at this point. The Raptors have clinched at least the No. 2 seed -- four games ahead of No. 3 Philadelphia with five to play for the Sixers. The best the Sixers can do is tie Toronto, but the Raptors own the tiebreaker. The Sixers have a four-game lead over Boston and Indiana. The Pacers can't catch the Sixers because the best they can do with four games left is tie the Sixers, who own the tiebreaker. The Boston Celtics, on the other hand, can technically catch the Sixers because they own the tiebreaker over Philly, but it would require Philly to lose all five of its remaining games and the Celtics to win all four of theirs. As mentioned above, the Celtics can still technically catch the Sixers for the No. 3 seed, but it would require Philly to lose out and Boston to win out. Don't count on it. Boston took over the No. 4 seed by beating Indiana on Friday, giving them a 2-1 head-to-head advantage and thus the tiebreaker for the moment. Indiana and Boston, however, still have one matchup left -- this Friday, which will obviously go a long way in determining how this shakes out. Our SportsLine projections still favor Indiana to end up ahead of the Celtics. The Pacers still control their own destiny to take the No. 4 seed. With four games to play, if they win out -- which would include a win over Boston -- there is no way Boston could catch them. Again, SportsLine projections like Indiana, which has clinched nothing worse than the No. 5 seed, to prevail for the No. 4 seed. This is where things get dicey in the East, with five teams still in the hunt for the final three spots. Detroit leads No. 7 Brooklyn and No. 8 Miami by one in the loss column, but Brooklyn has already clinched the tiebreaker over Detroit. The Pistons lead No. 9 Orlando by two in the loss column and also own the tiebreaker, which makes that an effective three-game lead with five to play. SportsLine gives Detroit a 97 percent chance to make the playoffs. The Nets have five super-tough games left -- two against the Bucks (who, to be fair, may be resting players), one against the Raptors (who may be doing the same), one against the Pacers, and then, in what could well be a play-in game, they close the season against the Heat. SportsLine gives Brooklyn a 75.6 percent chance of making the postseason. The fact that Brooklyn already owns the tiebreaker over current No. 9 Orlando goes a long way. Miami has rebounded after a big loss to Orlando to get back into the No. 8 slot ... for now. But our SportsLine projections have these teams slotted for the same number of wins, and with Orlando already owning the tiebreaker, that slots Orlando for the last playoff spot if the data prevails. There is a way, of course, that both Orlando and Miami could get in. Again, that last game of the season at Brooklyn could be a play-in game. As stated above: SportsLine has Orlando and Miami projected for the same number of wins, and with the Magic already owning the tiebreaker, that slots them for the last playoff spot if the data prevails.